Followers of this blog know that I usually report on the snowpack conditions in California once or twice during the winter. I do this because I have family living in California, and because California constitutes an incredibly large percentage of this nation’s economy, and because it provides an incredibly large percentage of the fruits and vegetables we eat. California depends on its snowpack for about 30% of its water supply. Climate change will reduce the California snowpack by as much as 40%, it is projected, putting the state’s water supply at risk. The snowpack is projected to decline mostly because the increased temperature will cause precipitation to fall as rain instead of snow, and because it will cause increased melting during the winter months. Figure 1. Source: California Data Exchange Center, 2019. Figure 2. Data source: Mammoth Mountain Ski Resort, 2019. Figure 3. 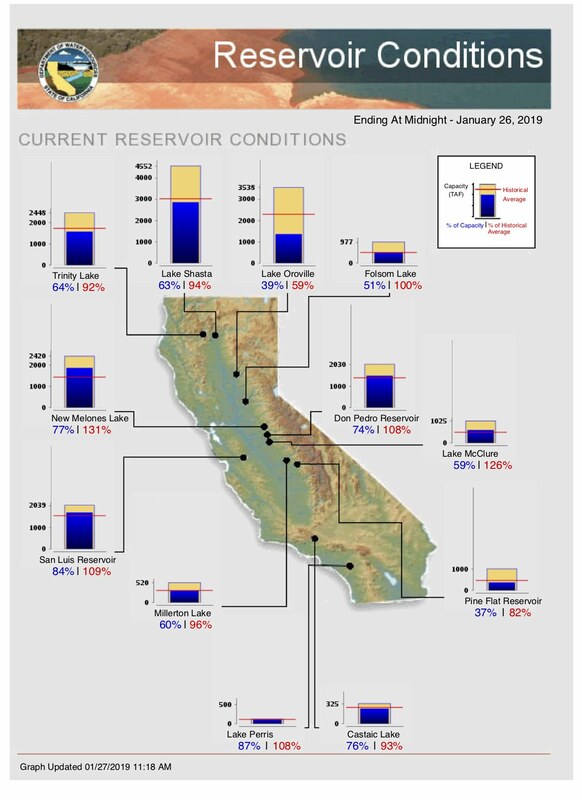 Source: California Department of Water Resources, 2019. Because California receives most of its water during the winter, but needs it most during the summer, the state operates many reservoirs. The water content of the most important are shown in Figure 3. The Lake Shasta, Trinity, and Oroville Reservoirs are the three largest, and thus, the most important. In general, the reservoirs appear to be close to normal levels for this time of year. The one exception is the Oroville Reservoir, which is at 39% of capacity. This reservoir was severely damaged in 2017, when storms caused emergency releases, which eroded away major portions of the dam. Repairs were completed last fall, but the dam has yet to refill. Whether it will ever refill given California’s reduction in snowpack is an interesting question to which I don’t know the answer. Oroville is the major water source for the California State Water Project, and, thus, it is important. The Colorado River is another important source of water for California, and Lake Mead is the principal reservoir at which its level is measured. It is at 1085.21 ft. above sea level, or 40% of its capacity. For this date the average is 1159 ft. above sea level, and the historical low was 1083.46 ft. above sea level, reached in 2016. Lake Mead can be recharged with water from Lake Powell, and that reservoir is also at 40% of capacity. It is usual for these reservoirs to be low during the late fall, and then recharge during the winter. However, Lake Mead continues to flirt with historical lows and with the level at which mandatory water restrictions go into effect. The bottom line here is that California’s water supply continues to be below historical levels, though not quite as low as during the terrible drought a few years ago. As of right now, signs do not point to a severe water crisis this year, but the state continues to walk a rather fine line. Should drought recur, a severe crisis is likely to occur..
Alexander, Kurtis. 2018. “Oroville Dam Fixed and Ready to Go, Officials Say – But at a Big Price.” San Francisco Chronicle. 10/31/2018. California Data Exchange Center. 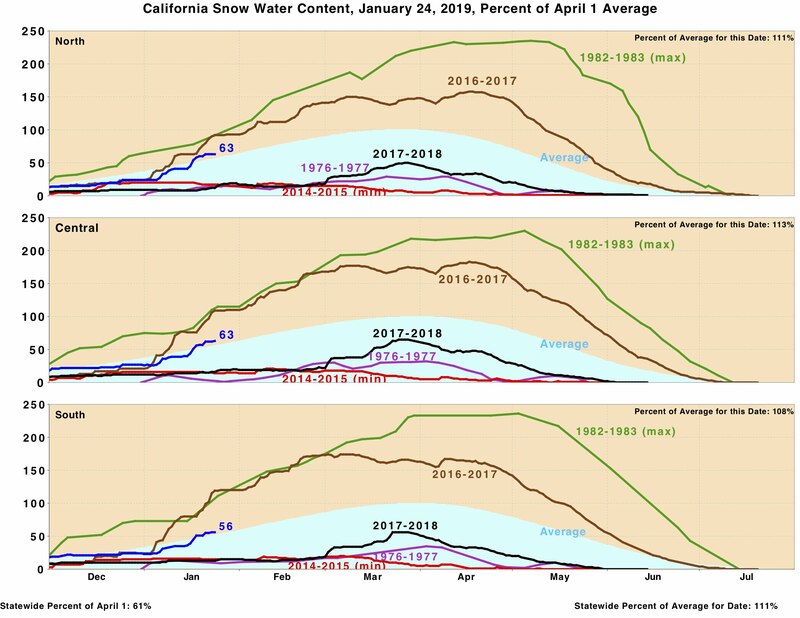 California Snowpack Water Content, January 24, 2019, Percent of April 1 Level. Downloaded 1.27.2019 from https://cdec.water.ca.gov/reportapp/javareports?name=PLOT_SWC.pdf. California Department of Water Resources. Current Reservoir Conditions. Downloaded 1/27/2019 from http://cdec.water.ca.gov/reportapp/javareports?name=rescond.pdf. Lake Mead Water Database. Viewed online 1/27/2019 at http://lakemead.water-data.com. Mammoth Mountain Ski Resort. Snow & Weather Report. 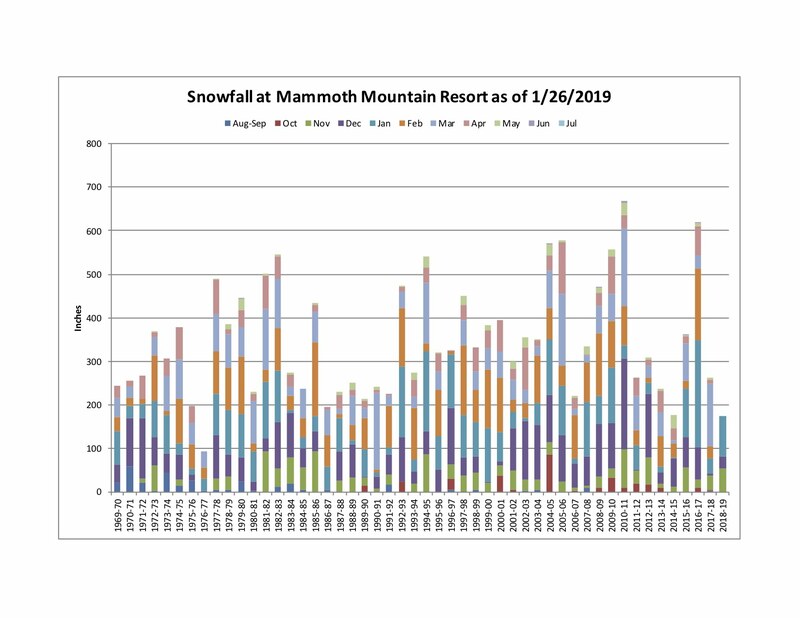 Viewed online 1/27/2019 at https://www.mammothmountain.com/winter/mountain-information/mountain-information. By mogreenstats in Climate Change, Weather Patterns on 2019/01/31 .